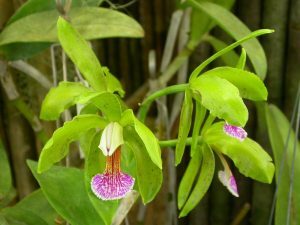 The orchids are plants that live everywhere on Earth, except for Antarctica; these plants are one of the largest plant families in the world. Terrestrial: these live well in moderate and cold climates. Their tubercles will not freeze during winter, its roots will develop properly inside the soil. Epyphite: these live well in the tropical climates, by hanging on trees or other vegetal species. These have aerial roots they use to stay on trees. Lithophyte: these are species that live on rocks. 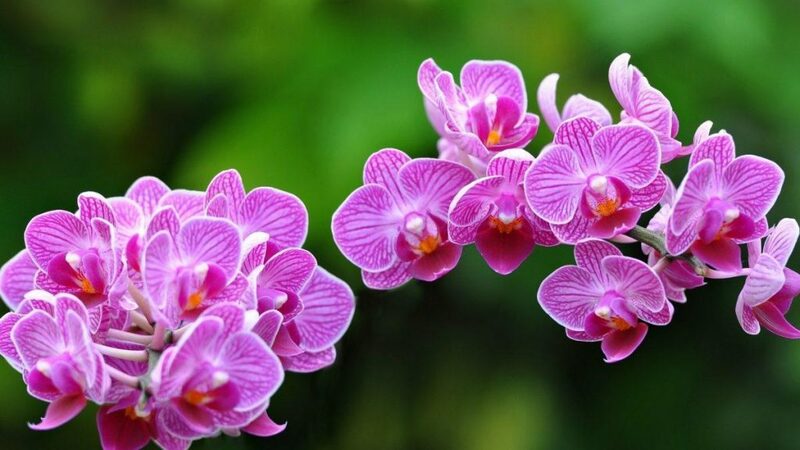 Phalaenopsis, also known as the moth orchid, originated from Indonesia, North Australia, East Asia. It has thick roots, with wide leaves and high stems where 3 to 5 flowers grow. It can be placed in a sunny or semi-shadowed spot, warm, with temperatures ranging between 20 – 22 degrees Celsius. It prefers windows that have an eastern or northern exposure. It must be constantly watered, every once in a while the underlayer can be left dried. Water this plant once every 10-14 days during winter time (depending on the temperature – if it’s warmer it needs to be watered more often, if it’s cold it must be watered less), and during summer time it needs to be watered once or twice per week. During summer, fertilizers must be applied once every 2 weeks, and during winter it needs to be fertilized once a month. The plant can be moved once every 1-2 years into a bigger, transparent flowerpot. 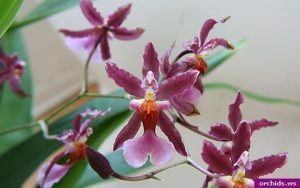 Use the special orchid underlayer (bark). Before moving to a different pot, it is best if the dead roots and fallen and yellow leaves are removed. 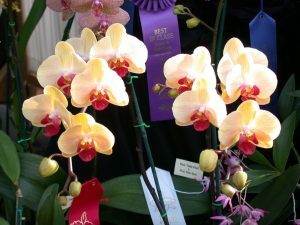 The Phalaenopsis orchid is sensitive to the wooly apple aphids and to the grey mold. 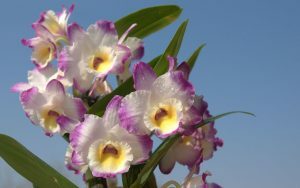 The Cattleya orchid is famous for its beautiful flower and pleasant scent, it originated from the jungles of Central and South America. 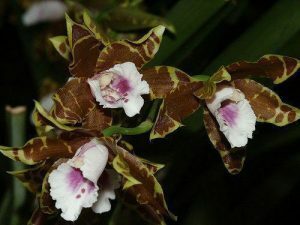 It is a sympodial orchid, with one rhizome, out of each, different pseudobulbs grow every year. When mature, these will form a pod where the flower blossoms will grow. The pseudobulbs are elongated, carrying 1, 2 or 3 flowers. The leaves are thick and waxed. The color of the flowers can vary from white to brown, red, yellow, green, orange, etc. It needs a strong light source, but a southern exposure will hurt it, as its leaves get easily burned. It loved an eastern or western exposure. 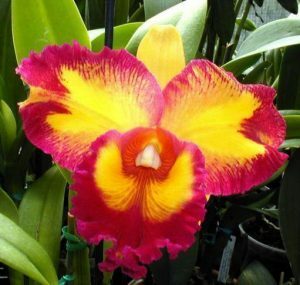 The Cattleya orchid needs high temperatures, ranging from 20 to 22 degrees Celsius. During the warm season, it needs to be watered once every 3-4 days, allowing the underlayer to dry a bit between each watering. Its leaves can be sprayed with water in the mornings and evenings. During winter, when the plant will enter its rest period, it needs to be watered only once every 10-12 days, with a few drops of water. Fertilize it once every 2 weeks during summer and once a month during winter. 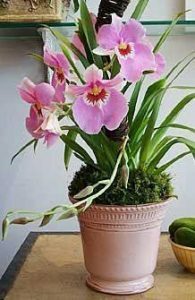 The plant can be moved to a different flowerpot once every 1-2 years, placing it in a special orchid bark mixture. 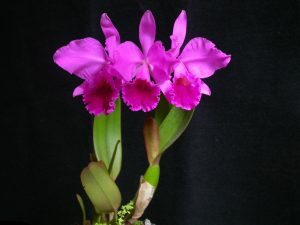 The Cattleya is sensitive to the wooly apple aphids and spiders. 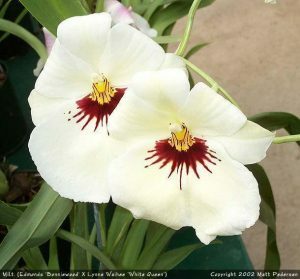 The Miltonia orchid originated from Central and South America, it is also known as the pansy Orchid. It can grow up to 50-cm high, it has compressed bulbs that blossom year-round. Its leaves are linear, 20-30-cm high. The perfumed flowers can live for 5-6 weeks and their color can range from white to yellow or pink; the flowers can be solitary or grouped in inflorescences formed of 6-10 flowers. It needs to be placed in a sunny and aired spot, with constant temperatures ranging from 10 to 25 degrees Celsius year-round. Regularly water it once every 2-3 days during summer, and once every 5-6 days during winter, depending on the temperature of the environment. When the air humidity is low, we recommend spraying the leaves with room temperature water. The ideal temperature for daytime is 21-29 degrees Celsius, and for night-time it is 12-18 degrees Celsius. 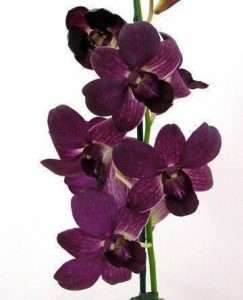 It needs to be fertilized on a monthly basis during April – September, using special orchid fertilizers. 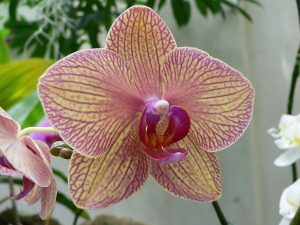 The plant can be moved once every 2 years, using special orchid substrate. It is sensitive to aphids, greenhouse whiteflies, mites and the wooly apple aphids. 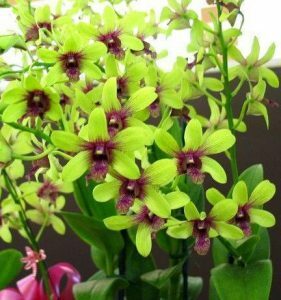 Dendrobium is an epiphyte orchid, that originated from Singapore, Thailand and New Guinee. Its size varies from 15-cm to 100-cm. Its leaves are smooth, similar to a riband, of a fresh green color. 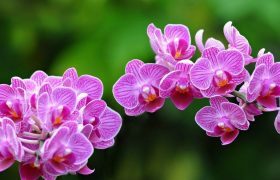 The flowers grow on flower rods, either solitary or grouped in inflorescences formed of 10 flowers, which last 2 months. The shape and color vary from one species to another, the colors can be white, pink, purple, yellow, green, orange, etc. It prefers a semi-shadowed spot year-round. The plant needs to be exposed to light, but not direct sunlight. 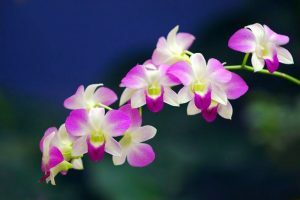 The roots of the Dendrobium orchid do not like damp soil, this is why this orchid must be watered by spraying it, to create a humid environment around it. 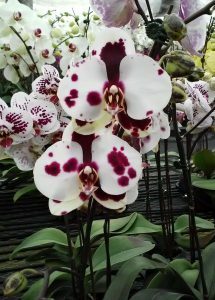 During winter the orchid must be watered less, making sure its substrate is almost dry. 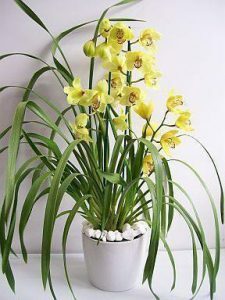 It needs to be fertilized from April until September, twice a month, using special orchid fertilizers. 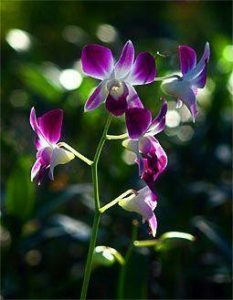 This orchid can be moved once every 2-3 months, into a special substrate formed of pine bark, fern roots and peat. It is sensitive to the wooly apple aphids and mold, if the humidity is high. 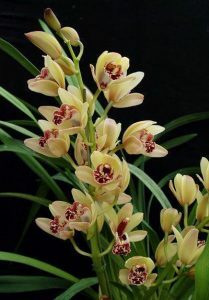 Cymbidium, also known as the boat orchid, is an epiphyte orchid that originated from the temperate and tropical climate areas of India, China, Japan, Nepal, Malaysia and Asia. It grows 90-cm long, it has very long leaves that have a light green color. 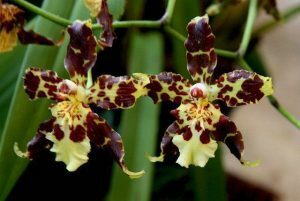 Its flowers are 5-10-cm long, of different colors, such as: white, yellow, orange, purple, red, brown, green, etc. The flowers have a delicate scent and can live 3-4 months on the rod, if the necessary environment and temperatures are maintained. It needs 10-14 degrees Celsius during night-time, during the day it needs a lot of light, this is why placing it outdoors during summer will favor the growth of the flower blossoms. During spring until autumn, is needs to be watered from top to bottom, leaving the excess water to drain. Its compost must be dry before it can be watered again. We recommend using fertilizers once every 2 weeks during summer and once a month during winter. 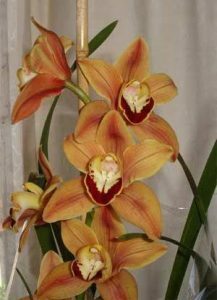 The Cymbidium orchid is sensitive to the red spider mites, aphids and wooly apple aphids. 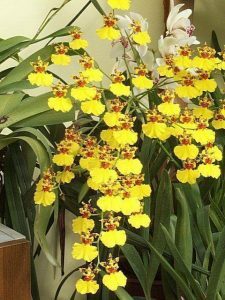 The Oncidium orchid, also known as the dancing-lady orchid, is an epiphyte orchid that originated from the tropical areas of Central America. It is 100-cm high and 50-cm long, with characteristic small bulbs located on the surface of the ground. 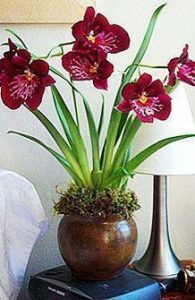 The pseudobulbs each grow 1-2 linear, dark green leaves. The number of the flowers can vary from one species to another, the flowers can either be solitary or grouped in inflorescences. Most of the flowers are yellow, but there are species that have white or pink flowers. Water it regularly, every 2-3 days during summer, during winter water it once every 6-8 days. Make sure the substrate is dry before you water this orchid again. When there is a low air humidity, spray the leaves with room temperature water. 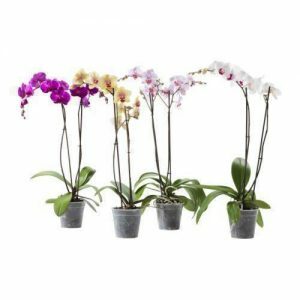 The fertilizers that need to be applied need to be special orchid fertilizers, apply this once every 2 weeks during summer and once a month during winter. 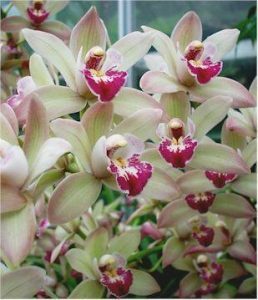 The plant can be moved during spring or autumn, once every 2 years, using a special orchid substrate. 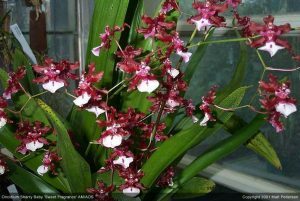 The oncidium orchid is sensitive to acari and the wooly apple aphids.